Then we start treating the individual dog. Our goal with shy dogs should not be in fixing them. We should try to help them feel safe. And sometimes just making them feel safe might even help them on the road to recovery. We don't expect Jack Russell Terriers and Border Collies to be couch potatoes; we don't expect Basset Hounds to win agility competitions; and we don't expect pugs to excel at herding. Turning our shy dogs into happy-go-lucky party animals might be a very unrealistic goal. 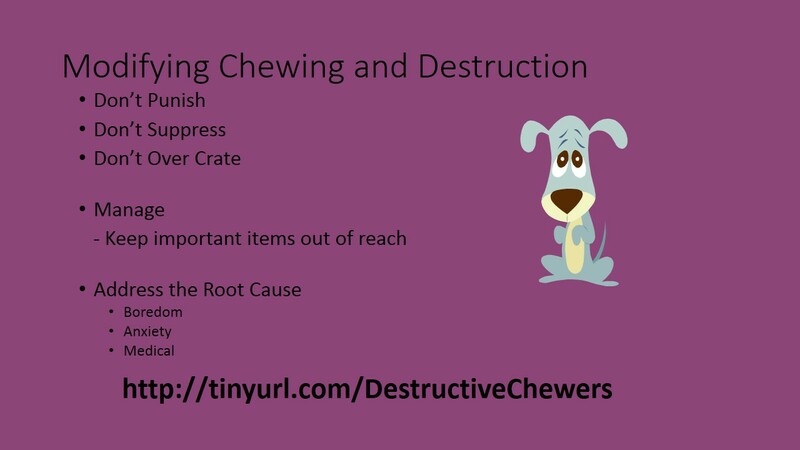 But removing all scary things from our dog's life might result in a poorer quality of life. If our dogs are afraid of walks, we might want to help them feel better about going on walks. Walking is just one example, we might want to help our dog feel better about car rides, thunderstorms, neighbor nose etc.. When we start working on our dog's fears - we need to work on one thing at a time and we need to avoid flooding our dogs. Flooding is basically forcing our dogs to "face their fears" - Flooding is stressful to our dogs; it can make our dogs more fearful and in some cases; we can even turn shy dogs into aggressive dogs. So if we can't flood and we can't lure with treats, how do we help our dogs feel better about scary things? Through Counter Conditioning and Desensitization. We start at a place where the dog is not scared, then let our dog set the pace. to wade through a pit of snakes or frogs or spiders, etc..
You come home from a hard day at work and find your house in shambles. The stuffing is out of your sofa, your coffee table's legs are chewed up, some of your clothes are in the living room instead of the closet.. What do you do? Take a deep breath, count to 10 and remember that spot did not destroy your house out of spite or defiance. 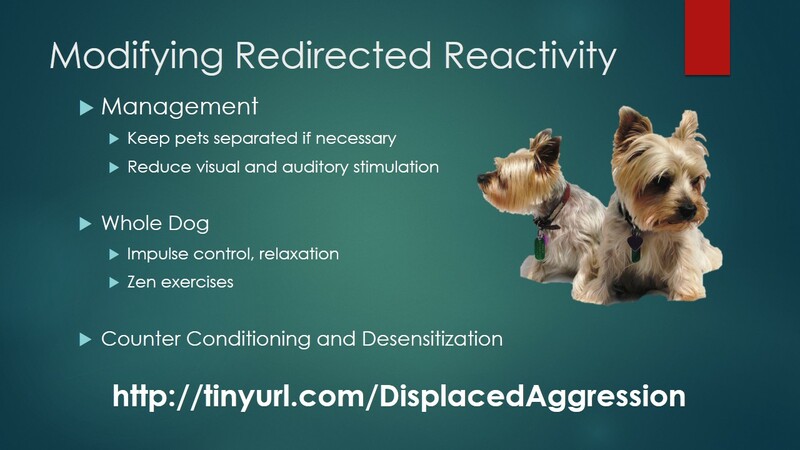 "Displaced aggression, displaced reactivity, redirecting" is attacking something that isn't the source of the frustration. 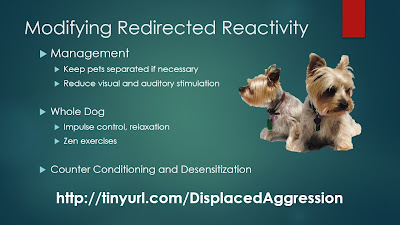 In her book, Behavior Adjustment Training, Grisha Stewart describes redirection as "where your reactive dog goes after your other dog because he can't reach the real target." From the mail bag: My dog bites his rear toenails - not obsessively, but every once in awhile. I don't mind because I don't have to clip them and I even used to do the same thing (bite my nails that is, not his). Anyway, I'm just wondering if he could be doing any damage to his toes or feet that I'm not aware of. It doesn't appear to be allergies, because he just bites the nails. Have you ever heard or seen this? From the mail bag: Have you heard or seen anything about the artificial turf with respect to dogs? Supposedly, it's guaranteed for life, doesn't need watering (obviously), and "looks like" a lawn. In my last post on yard cover, I wrote that I was interested in rubber mulch for the space between my redundant fencing. I purchased a couple of bags today along with some weed block and I went to work. A question posed by one of my readers has me thinking about rubber mulch for my yard - not the entire yard but the space in between my double fence. 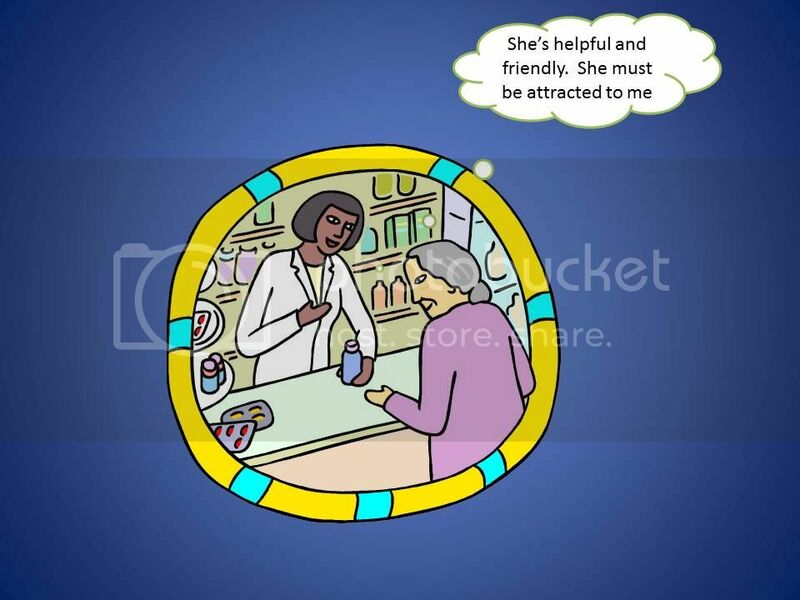 Do you work in a service profession? A job where you are required to be friendly and personable (cashier, wait staff, bartender, exotic dancer, teacher, etc...)? I recently had a tree removed and grinded down in South Central Texas (hot). The result is a layer of shavings, ranging from sawdust-texture to bark-like chunks. This has made for great fun for my dogs when they are playing fetch - they love sliding in it and it's also easy to cleanup waste (it hasn't rained yet, so I don't know what that will do to it). Is there any risk that they will get splinters or is that only possible with living tree bark? So far, they have been going at it heavily for a couple of weeks with no problems - have you heard of anyone covering their yard with this "thick" sawdust? Well, I just got a few splinters when I was moving some wood posts that fence workers had left. And I also got splinters from trying to build a sandbox for my dog. So we can definitely get splinters from dead wood. If you haven't done so already, I suggest running around barefoot. You might also try rolling around while wearing shorts and short sleeves. See if you get any irritation or splinters. I can't recall seeing any yards covered in saw dust but I have seen dog parks covered in mulch. I don't know if sawdust is good to use or not. Here are so possible pros and cons. -Lawns use up too much water; and South Texas doesn't have a lot of water to spare. - When we don't use grass, we need something to cover the ground to prevent erosion. Sawdust might do that. - -How close is the saw dust to your residence. Do you run the risk of attracting termites, carpenter ants, boring beetles? -I assume the tree was cut down because something was wrong with it? If so, are you just spreading whatever was wrong all around your yard? - Could the dogs inhale any of the finer shavings? - Could the dogs get any shavings in their eyes? - Flea don't do well in direct sunlight. Might fleas find the middle or bottom of the pile of shavings an attractive area to hang out in? - What about other animals that like cool, dark places? - Snakes maybe? 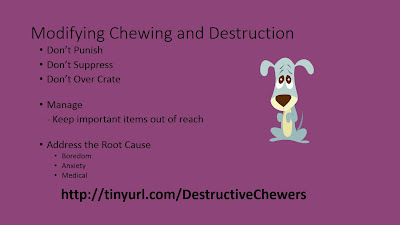 - Do you like to toss food out in the yard for your dogs? If so, are you concerned about them consuming any of the shavings? Does anyone have any saw dust success or cautionary stories? Tell us about it in the comments below. Contact petfinder.com about getting an account. If you can get an account, try to be as accurate as possible when listing breed, age, gender, personality, etc..
Several years ago I had abdominal surgery. I was fortunate enough to know well ahead of time that the surgery was going to happen. At the time, I lived with a 50 pound senior dog who sometimes had trouble getting up. Mail bag question: Why are some dogs afraid of people wearing hats? I've heard of dogs not liking certain people and different theories about this.